"A great summer salad for buffets or as a meal on its own." Place bulgur in a large bowl, and pour the boiling water and olive oil over it. Stir, cover, and let stand for 15 to 20 minutes. When all of the water has been absorbed and the bulgur is tender, stir in the lemon juice, cucumber, green onions, parsley, and mint. Season with coriander, ginger, salt and pepper. Garnish with shrimp. See how to make a creamy shrimp salad with pasta shells. You can substitute 3 tomatoes for the cucumber, or use a combination of cucumber and tomatoes in this salad. 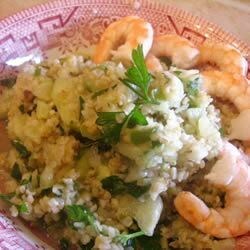 Best recipe for tabbouleh i know of... i dont really think the large shrimp are really necessary, and it might actually be better with more bite-size shrimp.